Guerssen and Mental Experience have unearthed one of those Krautrock obscurities recorded and produced circa 1972-73 in Köln, Germany that was purported to have been released as an ultra-limited handmade edition, but no copies have ever surfaced. 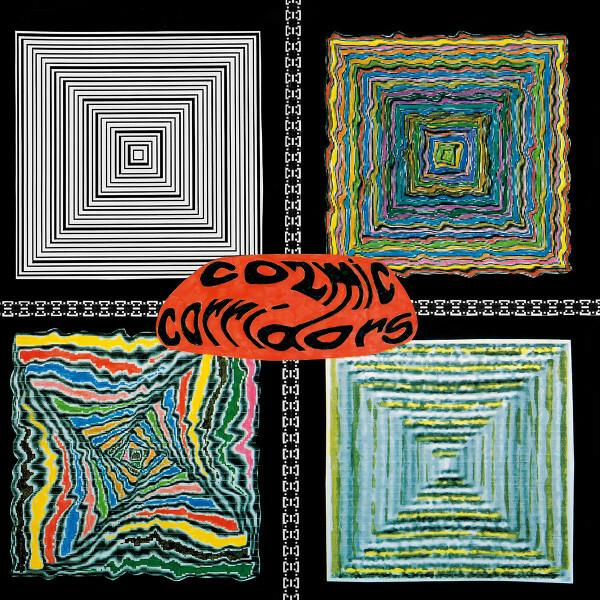 Cozmic Corridors were a mysterious band consisting of Alex Meyer (organ, vocals, synthesizer), Peter Förster (guitars, violin), Pauline Fund (vocals, percussion), and Mythos’s drummer Hans Jürgen Pütz (cello, percussion). They recorded their self-titled album under the guidance of Toby “The Mad Twiddler” Robinson, who had worked in Dieter Dirks studio in the mid-70s, and his equally obscure Pyramid label. The result was a set of five inventive and unconstrained instrumentals that could only have come out of Germany in the 70s. The opening track, “Dark Path,” is three minutes of sinister and eerie keyboards and early electronics. “The Summit” is reminiscent of Popol Vuh’s Affenstunde and In den Gärten Pharaos. The track begins with a pulsating two-note ostinato and trippy keboards. Eventually drones sneak in at the bottom with the electronics being replaced by gothic organ, and closing with subliminal whispers drifiting in and out of the music. “Mountainside” is a slowly evolving electronic piece with photon torpedos streaking through space, distorting the space-time continuum. There are slow ambient cello drones, ethereal vocal chanting to make this an extremely relaxing and moody trip that ends with the two-note sequence taken up on cello. “Niemand Versteht” is another cosmic trippy piece similar to Popol Vuh and could have been a soundtrack for a 70s horror movie. Poetess Pauline Fund can be heard reciting snatches of her work, peppered throughout the track, also reminding me of Ash Ra Tempel’s Starring Rosi. The album closes with “Daruber,” a dark gothic instrumental that can best be described by the imagery it conjured in my mind. An old man is shuffling home at night carrying his parcels down dark streets, moving from streetlight to streetlight. Suddenly he encounters a walled-off alley and stands transfixed by demonic chanting and throat singing that grows in volume and then tails away. Hypnotized, the old man’s consciousness floats in the aether, stripped of all sensory stimulation. Then in the distance the chanting begins to return. Has he died and gone to an alternative “heaven?” No, he drifts back into this body and continues his slow journey home and safety, no longer fearing death. This obscurity is sure to please lovers of Ash Ra, Popol Vuh, and other 70s cosmic Krautrock artists. And to tempt you further, Alan Freeman (Ultima Thule and The Crack in the Cosmic Egg) provides detailed liner notes, more than the one or two sentences in The Crack in the Cosmic Egg.